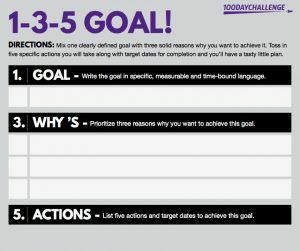 Use this FREE worksheet to brainstorm your three TOP priorities in life, and create an Action Plan for achieving those goals - FAST. Each of your three goals should be very specific, easily measurable and include a deadline. Example: Lose 24 pounds in 100 days, Create my first digital product in 30 days, Complete the rough draft of my book in 60 days, Double my income in 90 days, etc. Tip: be realistic about your time period, but also ambitious! Your top three reasons for wanting to achieve each goal need to be STRONG reasons. The actions you will take to achieve each goal should include completion dates. Simply copy and paste below the line, and work in your favorite brainstorming space - like Word, Google Docs or Evernote. The above copy & paste outline was based on the 1-3-5 Goal Setting System by Gary Ryan Blair as used in the 100 Day Challenge. If you feel like you can go it alone this time, and actually stick to it and succeed running solo then by all means dive in and fly with it! Join The Challenge & Get Started Today!